flydubai has signed a major order for Boeing aircraft today that has amazed the aviation world. The Gulf carrier has ordered 225 737 MAX aeroplanes with a list price of over $27 billion and is one of the largest-ever single-aisle jet orders ever. The deal was signed at the 2017 Dubai Airshow and includes a commitment for 175 MAX aircraft with purchase rights for 50 additional MAXs. However, despite the headlines, the deal has yet to be finalised and is still open to some negotiation. This new deal surpasses the flydubai's previous record order of 75 MAXs and 11 Next-Generation 737-800s which was signed at the 2013 Dubai Airshow. "We welcome the continuation of our long partnership with Boeing. Their aeroplanes have provided a foundation for the success of our business model, providing us with the operational flexibility and range to build a network of 95 destinations in 44 countries," said flydubai Chairman His Highness Sheikh Ahmed bin Saeed Al Maktoum. "Understanding the demand for travel across our network, our innovative approach to our cabin design and developing a product unique to our market has allowed us to exceed our passengers' expectations in their flying experience." "We are extremely honored that flydubai has selected to be an all-Boeing operator for many years to come. This record-breaking agreement builds on our strong partnership with flydubai and the other leading carriers of this region," said Boeing Commercial Airplanes President & CEO Kevin McAllister. 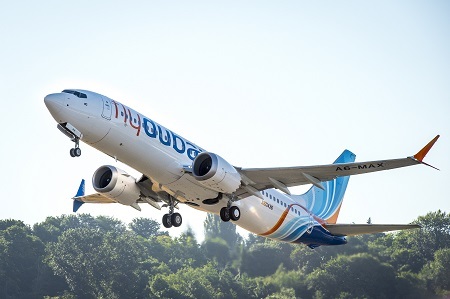 "With flydubai's proven business model and ambitious growth plans, we look forward to hundreds of flydubai 737 MAXs connecting Dubai with the rest of the world." flydubai placed its first order for 50 Next-Generation 737-800s in 2008 and was the world's first airline to introduce the Boeing Sky Interior into service. To date, flydubai has taken delivery of 63 737-800s and three 737 MAX 8 aircraft. It seems that while flydubai are keen to pay for new aircraft, they are not so keen on paying websites and webmasters that promote the airline. Affiliate marketing company Affiliate Window are among internet marketing companies that have dropped or suspended flydubai over non-payment of fees due to webmasters for flydubai banners and adverts they have carriedfly.